This easy white cake recipe is so moist and delicious. I also offer a pure white cake recipe that is always perfect and versatile for many dessert recipes. PREHEAT oven to 350 degrees. Butter three 8 inch cake pans and dust the inside with flour and tap out excess. Line the bottom of the pans with wax or parchment paper. Put the cake pans on a baking sheet lined with parchment paper or a silicone mat. Measure sifted flour, baking powder, and salt and sift together three times. IMPORTANT to follow these steps. Cream butter and add remaining 1 cup sugar; creaming together until light and fluffy. Add sifted ingredients alternately with milk a small amount at a time, beating after each addition until smooth. Mix in flavorings and set aside. In a mixing bowl, beat egg whites until foamy. Add 1/2 cup sugar gradually, and continue beating only until meringue will hold up in soft peaks and beat thoroughly into the cake batter. Spread evenly into prepared cake pans. Bake 25 to 30 minutes for the three 8" pans (30 to 35 minutes for the two 9" cakes). Transfer to a rack and cool for 5 minutes, then run a knife around the sides of the cakes, unmold them and peel off the paper liners. Invert and cool to room temperature, right side up. (These cooled cakes may be wrapped airtight and stored at room temperature overnight or frozen for up to two months.) 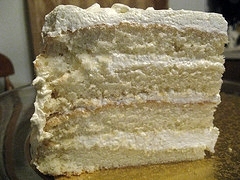 My next easy white cake recipe produces a perfect white cake that is lovely for special occasions. Scouting for a pure white cake recipe, I stumbled across this from The Bake More. PREHEAT oven to 375 degrees. Grease and flour three 9 inch cake pans. Cream sugar and shortening. Sift flour first, then measure - sift together with baking powder and salt. Add dry ingredients alternately with milk to the creamed sugar mixture. Beat thoroughly and add extract. Add egg whites, one at a time, mixing well after each addition. Pour into prepared cake pans. Bake for approximately 20 minutes. Test with a toothpick and when it comes out clean, the cake is done. This recipe also makes 24 cupcakes. **You may also use 1/4 cup evaporated milk diluted with 1/4 cup water. Use 1/4 cup coconut milk diluted with 1/4 cup water. If you choose to use coconut milk (canned) it does not change the flavor. It will not leave any coconut notes at all. Strain the coconut milk first before using.